Precut blank cards & inserts are available in multiple colors to place inside the pocket card. Please check your printer for size compatibility. The invitation pocket card is pearlescent and has a gorgeous shine. The paper shimmers in the light, has a beautiful soft sparkle and is metallic on both sides. This design has a horizontal pocket on the right flap of the card and a flap on the left to fold over the card. The card is 5" x 7" after folding. When designing, it is always good to remember that darker colors may rub off on lighter colors. We suggest that you consider using a layer (such as tissue) between the different colors. When assembled, the card will fit perfectly into an A7 Square Flap Envelope or A7 Euro Flap Envelope. Most pockets have a matching envelope in the same color. Pre-Cut Invitation - Solid Bright White Cardstock 80# (4 1/2" x 6 1/2") for A7 Himalaya design. What envelope will the A7 Himalaya Pocket fit inside of? Answer: This will fit inside the A7 Envelopes (5 ¼” x 7 ¼”) perfectly. The Himalaya Pocket Card is 5" x 7" when folded. 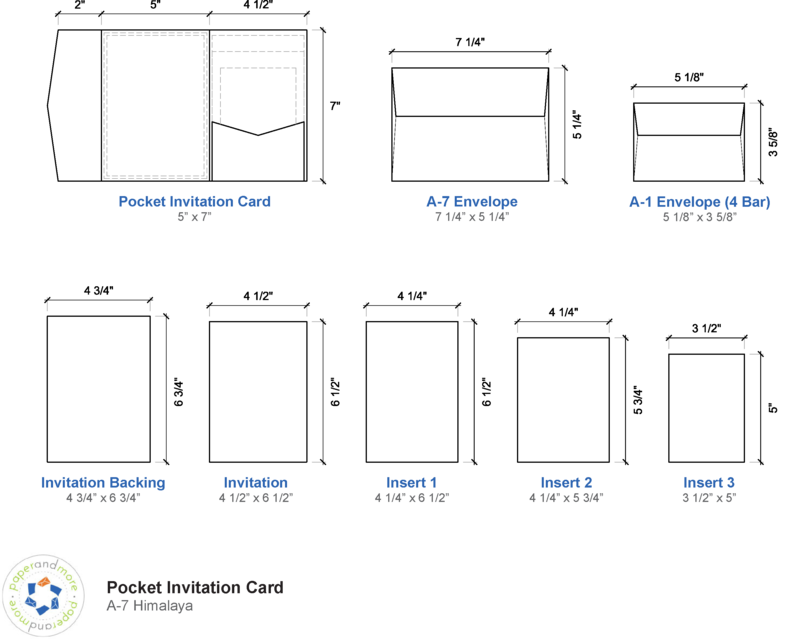 Please note, if using more then 3 inserts and 1 invitation, you may want to use an A7.5 (5 ½ x 7 ½) envelope. My invitation is 5" x 7", but this pocket has a recommneded invitation card of 4 3/4" x 6 3/4" or smaller. Do you have a larger Pocket that fits a 5x7 invitation? Yes! We carry an A7.5 pocket (5 ¼” x 7 ¼”) which fits a 5” x 7” inch invitation in the Center Flap. Which envelope can I place in the pocket for RSVP's? Do I need an envelope to mail a pocket? Are envelopes included with the purchase of pockets? Can I print on the pockets? What are pockets used for? Do you have designs I can use ? These items are often purchased together with this item: Crimson Red Metallic Pocket Invitation Card, A7 Himalaya. Click the right arrow (swipe on mobile) to view more items.